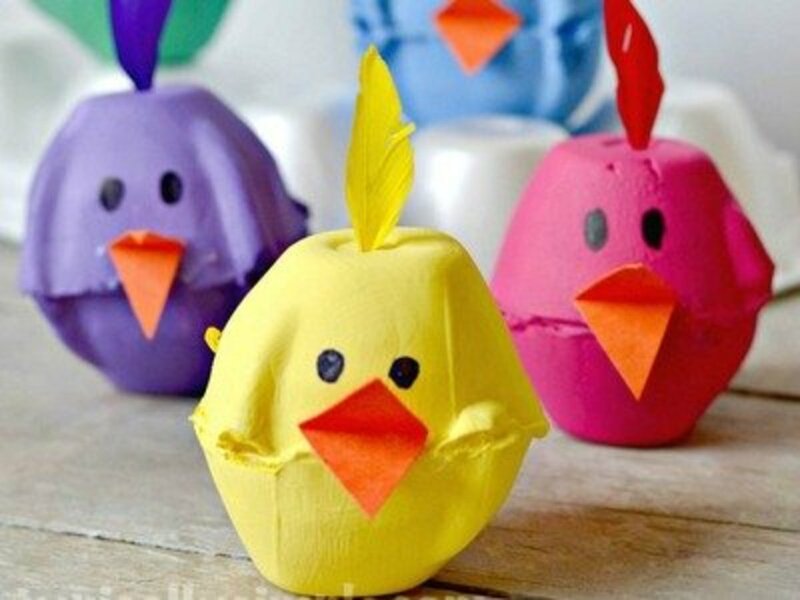 Upcycle Egg Cartons Into Exciting Crafts for Kids! 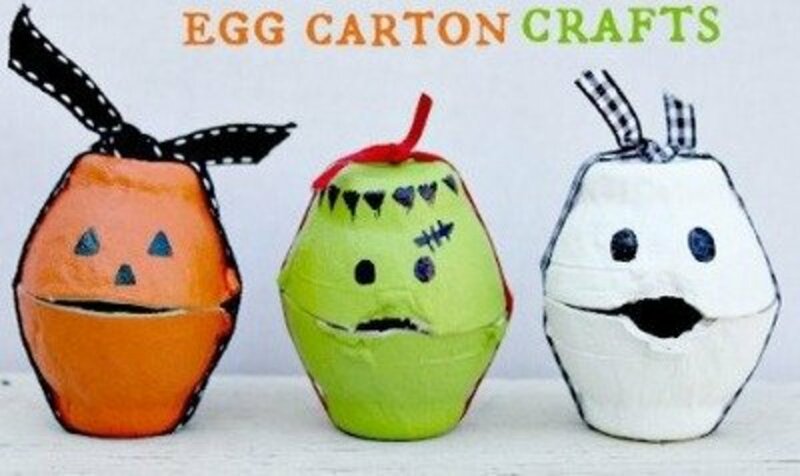 You will love making egg carton crafts when you see how many wonderful items can be made using them. 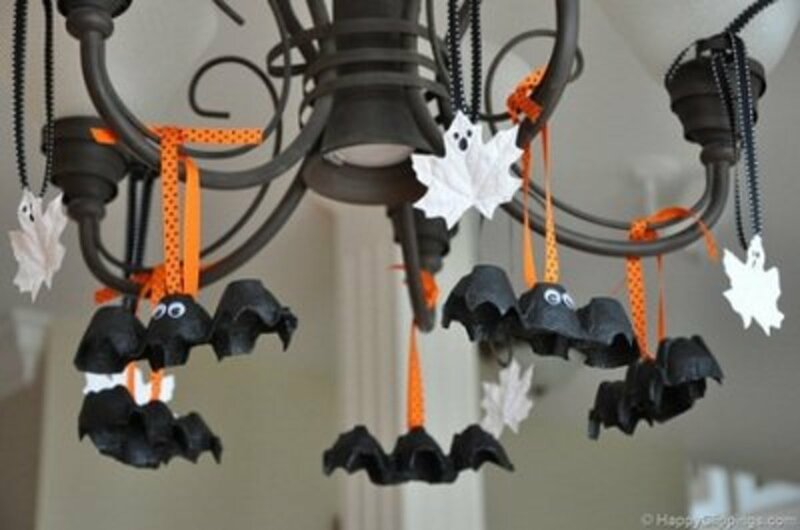 Make projects for all holidays and seasons, from Halloween and Christmas to spring and winter. Many of these ideas are suitable for preschool-aged or older children. 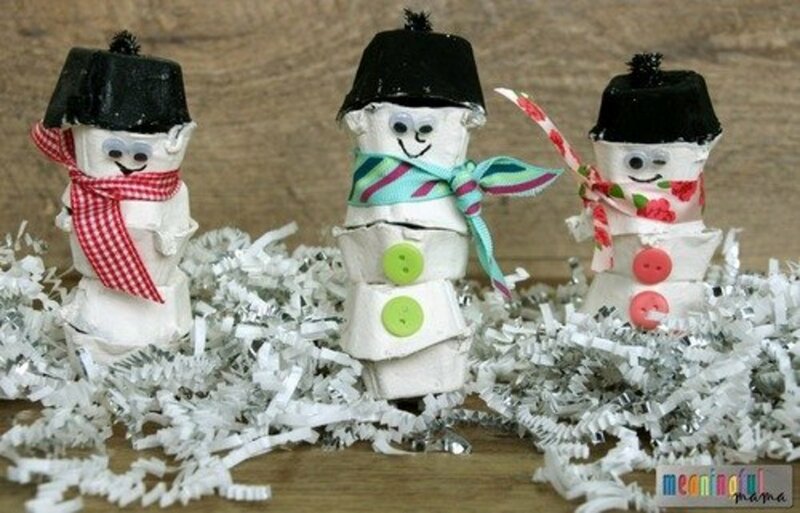 Go to the Meaningful Mama site for the cute and crafty snowman tutorial. 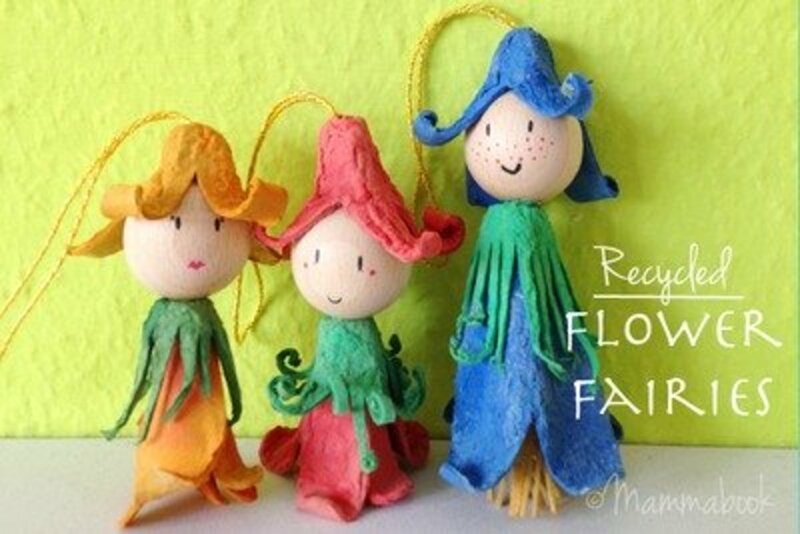 These have got to be about the cutest little fairies that the kids can make for their fairy gardens. I'll be sure to show this project to my little granddaughters. I know they will love making these fairies! 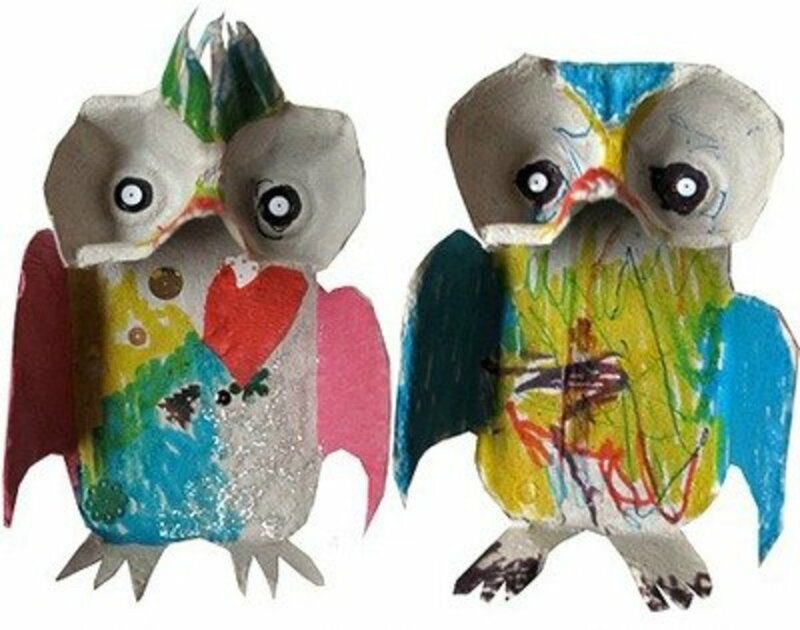 Preschoolers and kindergarten kids will love making this egg carton owl. The pieces are large enough for them to comfortably hold and paint their project. 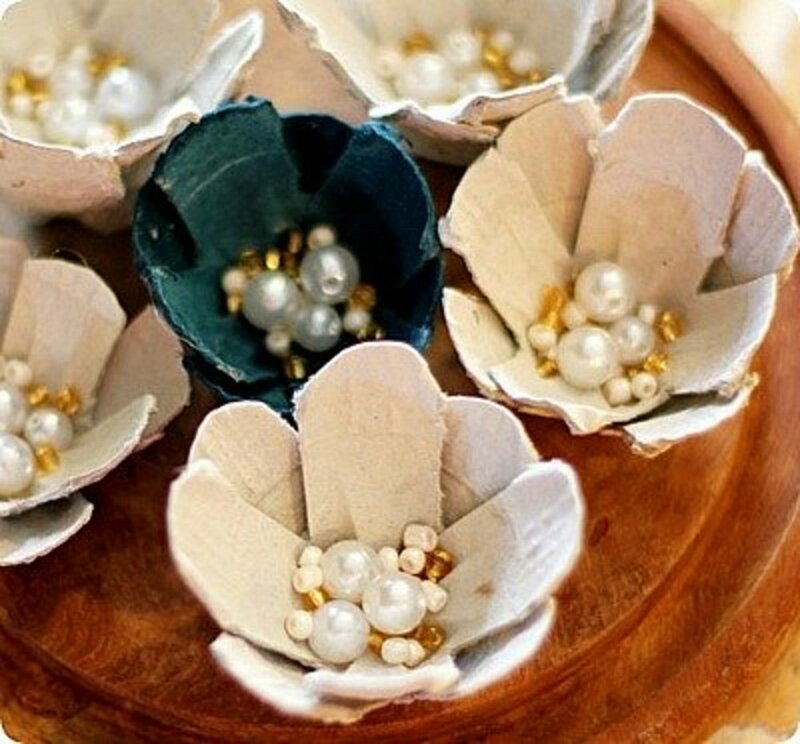 You can make these beautiful egg carton flowers for Mother's Day or for a teacher's appreciation gift. It never fails to amaze me what crafters will imagine and make. 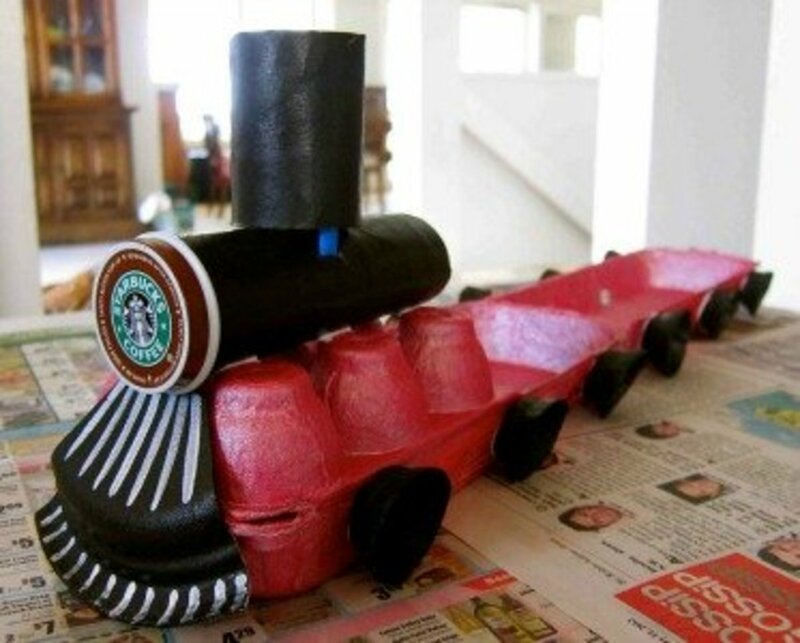 This little train is an example of the ingenuity of crafters. 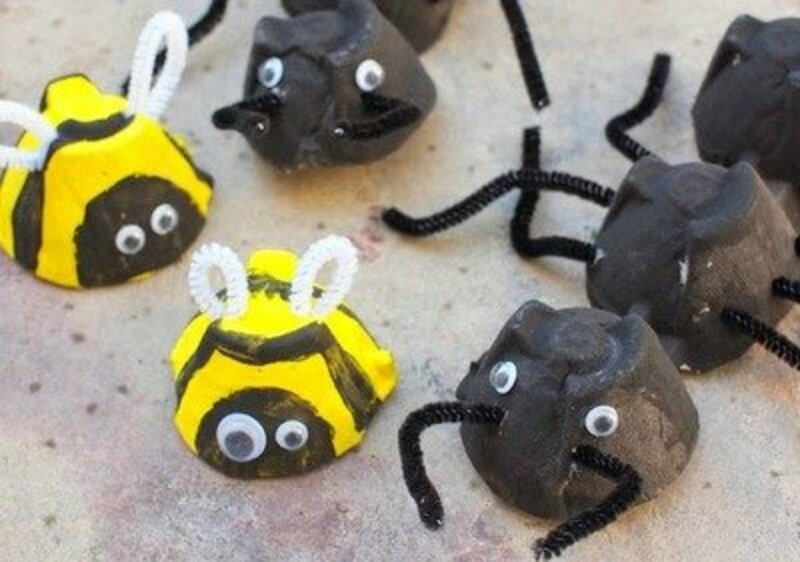 What fun the kids will have making these bumble bees and giant ants using egg cartons. Notice this cute little bunny's eyes and the happy smile on his face. 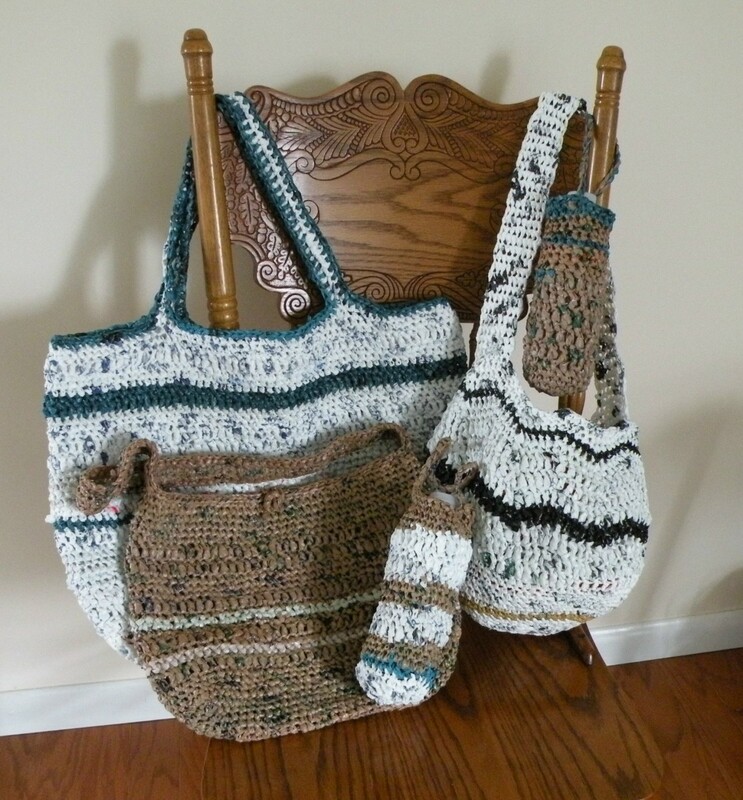 It's a simple project and yields adorable results. 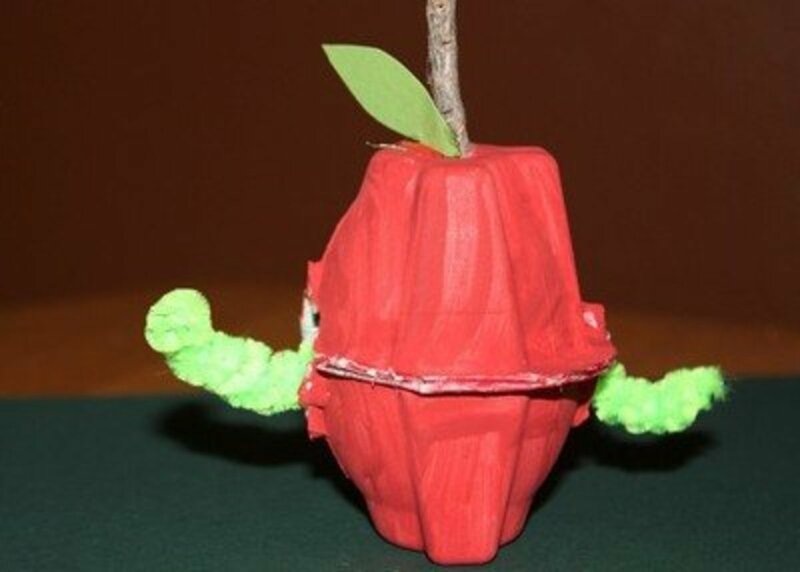 Talk about a good deal—with this apple project, you also get a worm! 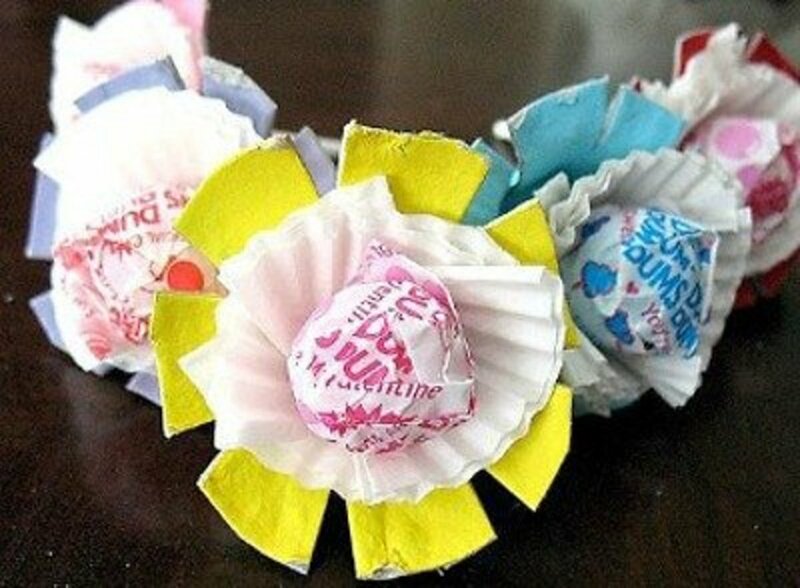 Make this for your teacher, and she'll love the thoughtful gesture. 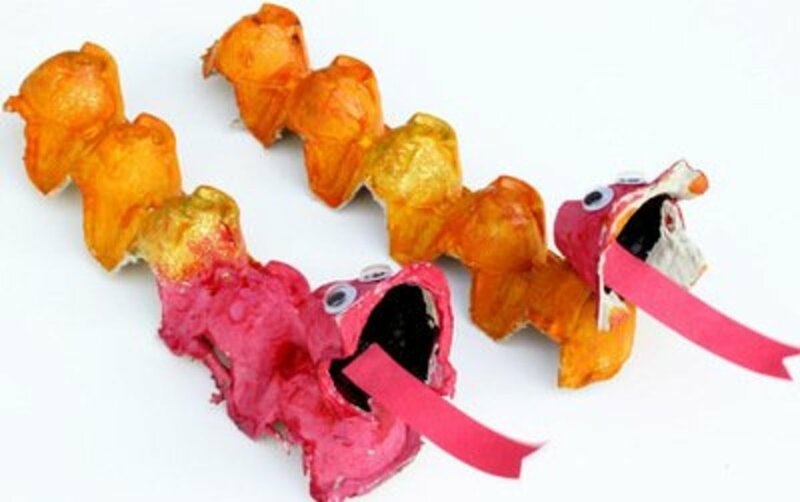 Make these Chinese dragons to celebrate Chinese New Year. 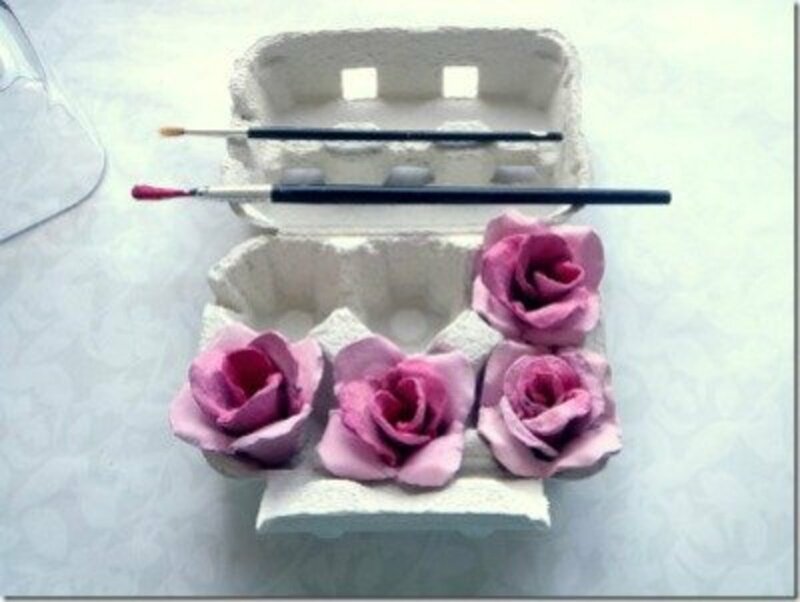 The directions for making this egg carton project can be found at Happiness Is Homemade. 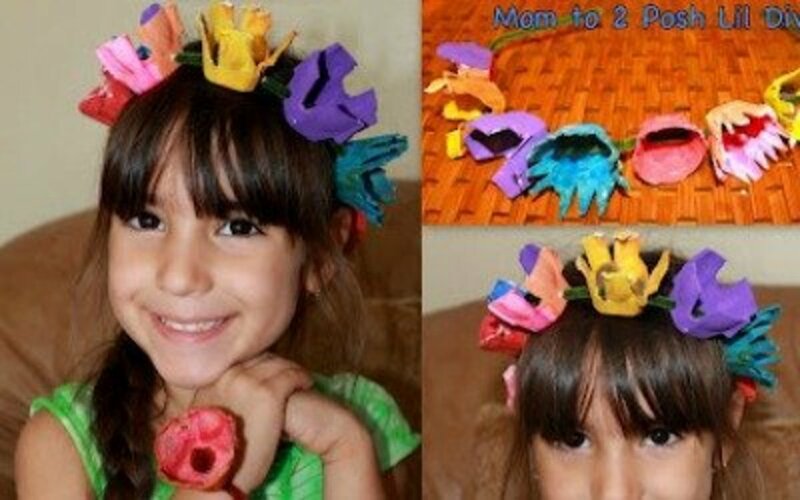 Imagine how your little princess or prince will love making and wearing a colorful tiara like this. It's so inexpensive and easy to make. 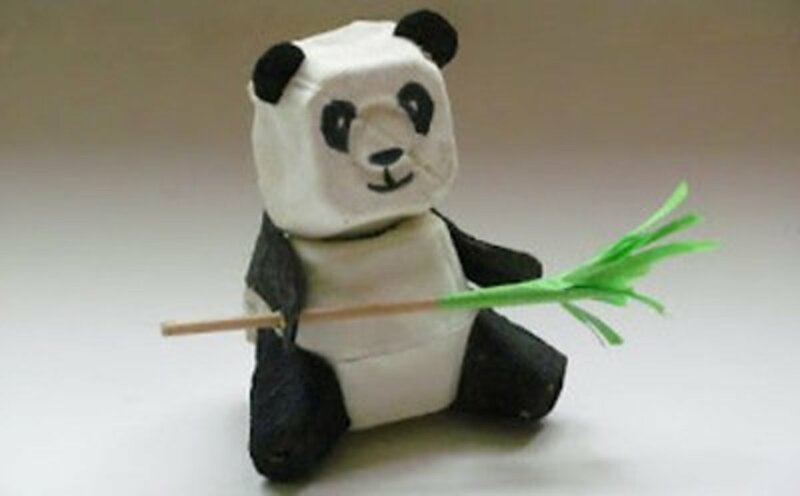 Make this simple and easy panda bear. You can even use a shoebox to create a little diorama for a school report! These tulips are a great project for kids and for seniors. The finished bouquet makes a great gift, and the recipient will be so pleased to display it. 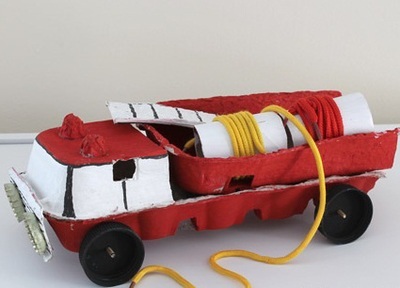 Egg cartons and bottle caps are the main supplies that you'll need to make this fire truck. Kids will have so much fun dreaming up ways to play with this! 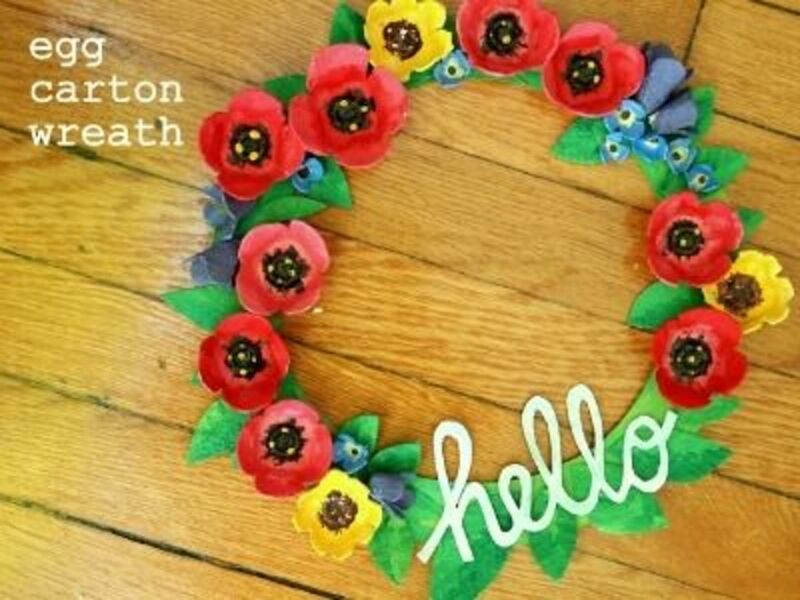 This is such a beautiful spring-inspired wreath! 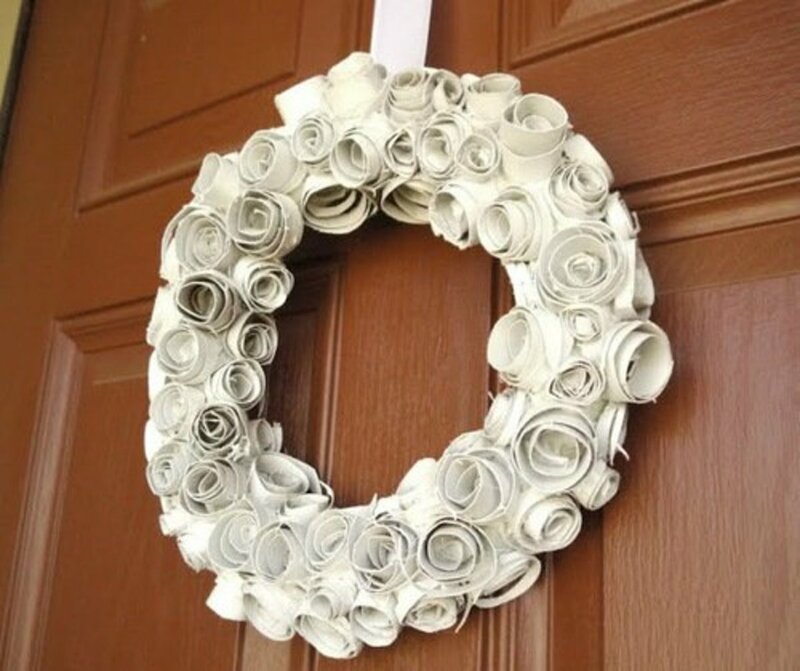 You can find the directions at Canadian Family and make one for your home. 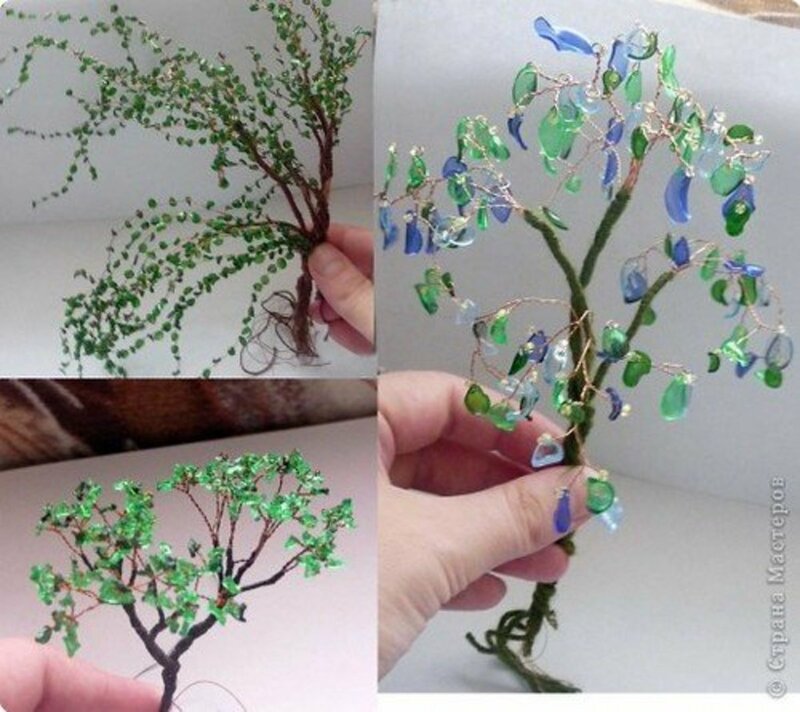 Wouldn't a few of these branches look nice in a tall vase? 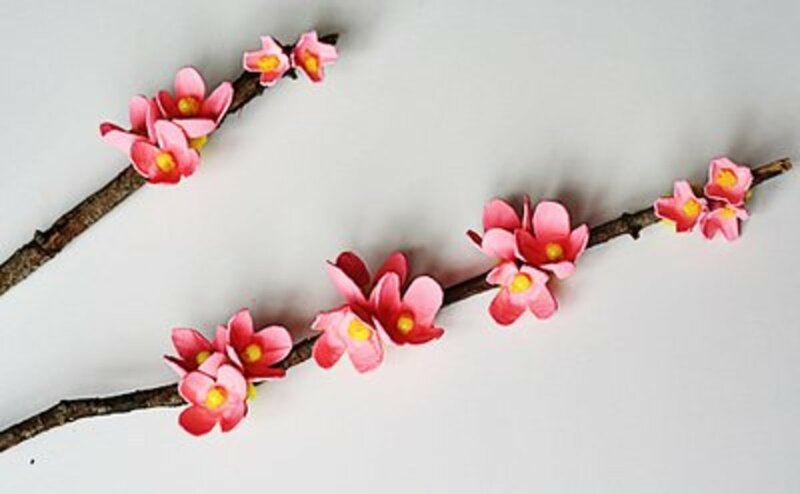 You can find the tutorial for making the cherry blossom branches at Crafts By Amanda. 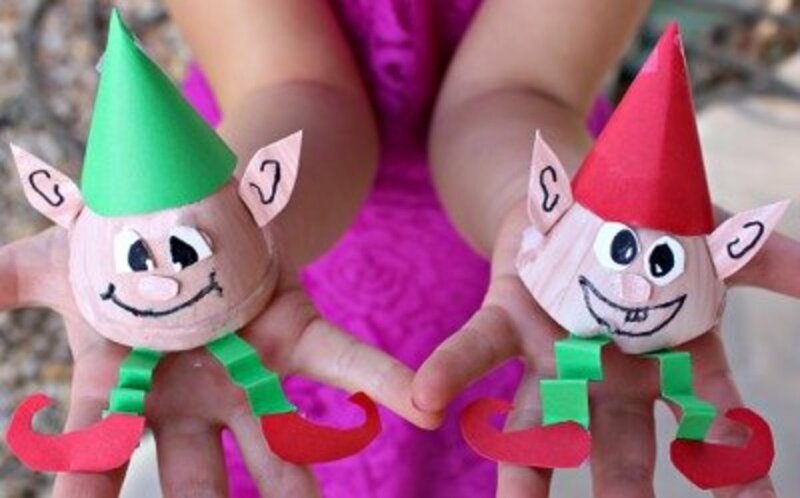 These little Christmas elves are just too cute for words. 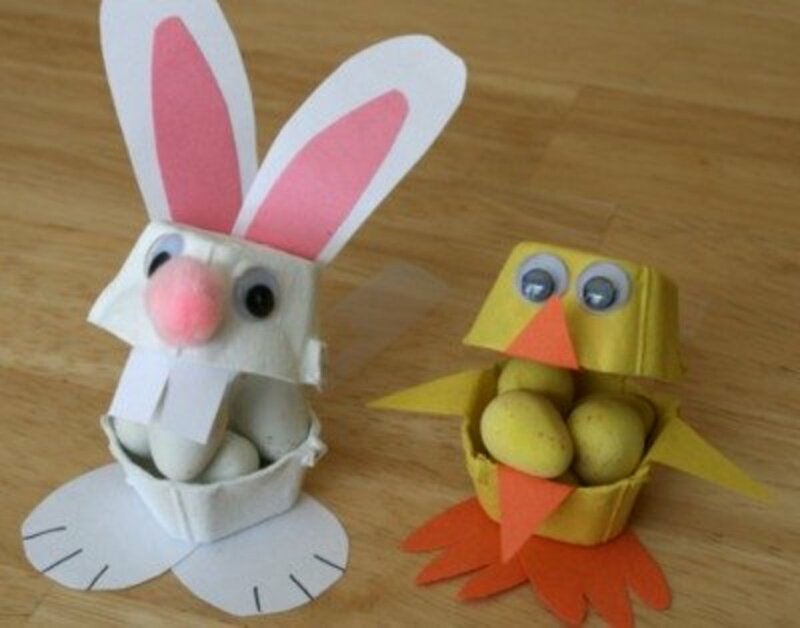 The kids will love making these out of egg cartons. 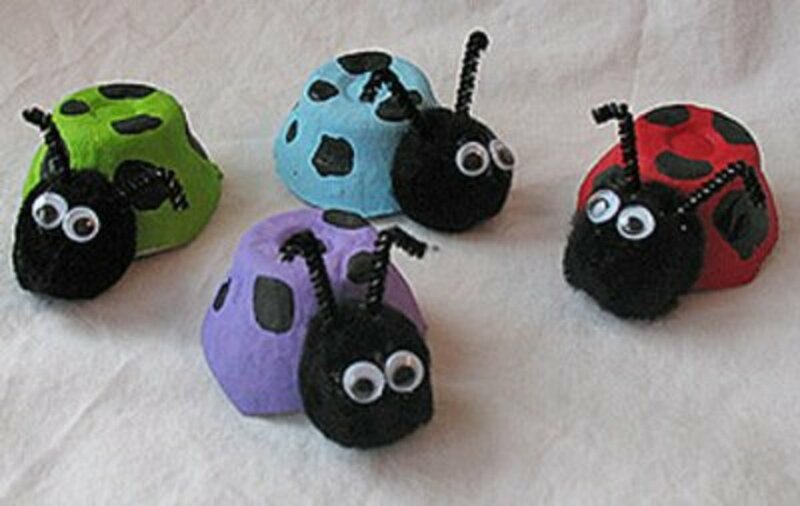 It would be fun to make a big batch of these ladybugs to crawl around a houseplant or plants. 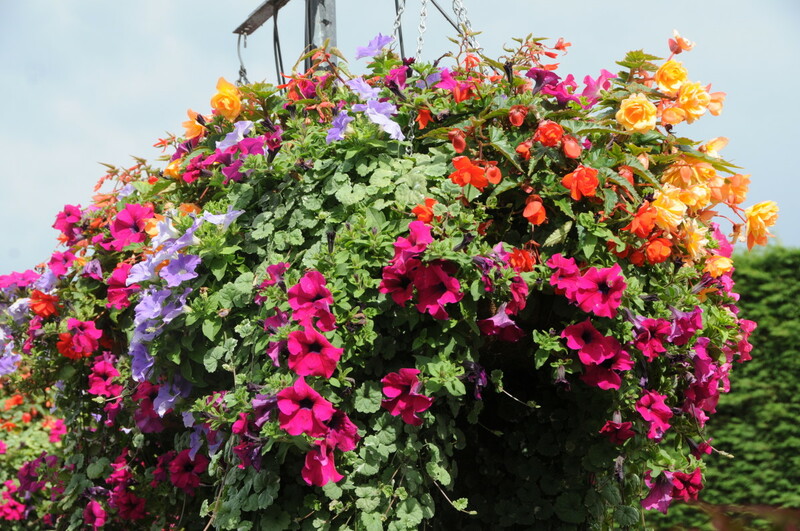 I guess I'd call this a garland, but bunting works, too. Make this Halloween decoration by following the instructions given at ZingZingTree. 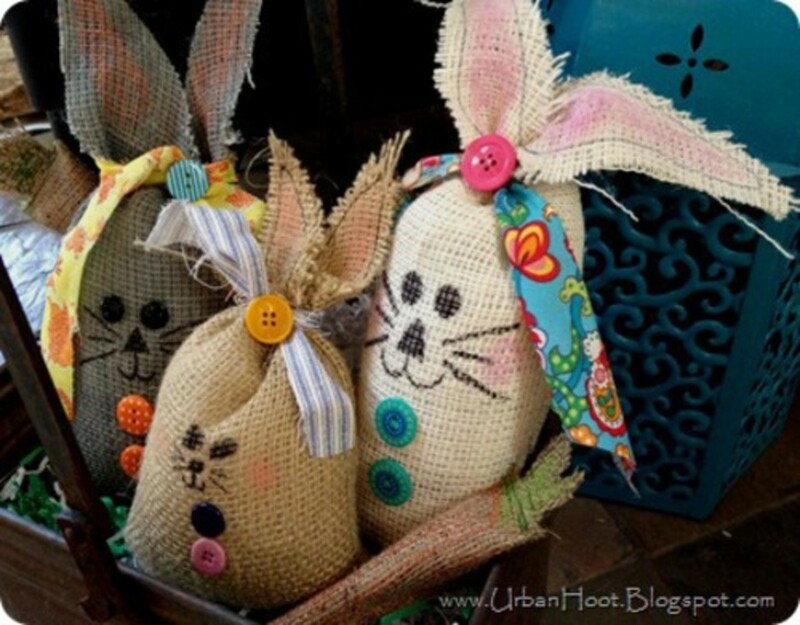 A Mommy's Creative Binge is the place to find the tutorial for making these precious bunnies and chicks. These roses are so beautiful! Make a bouquet of these roses by following the directions at Rosi Jo’. 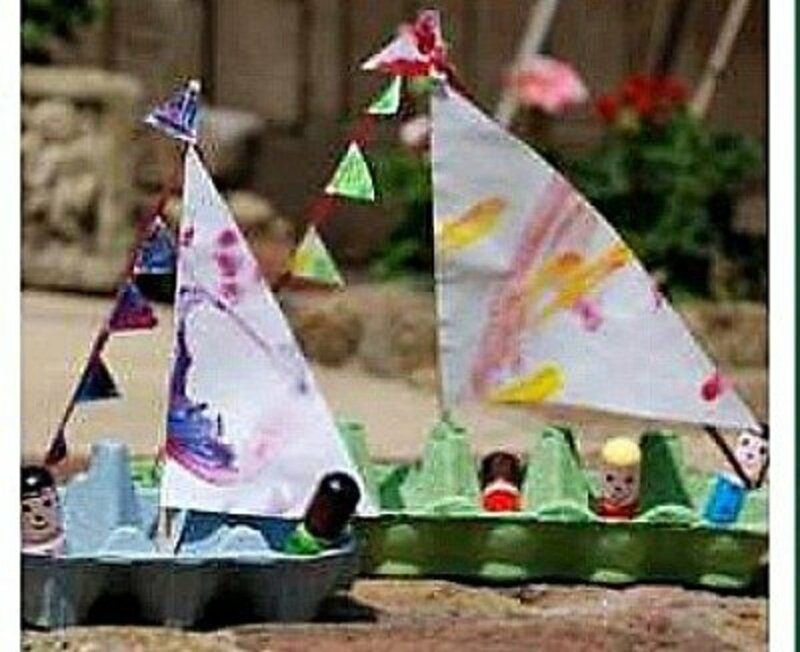 I can just imagine how excited little boys would be to make these little egg carton boats. The colorful fish in this project would make a cute mobile. 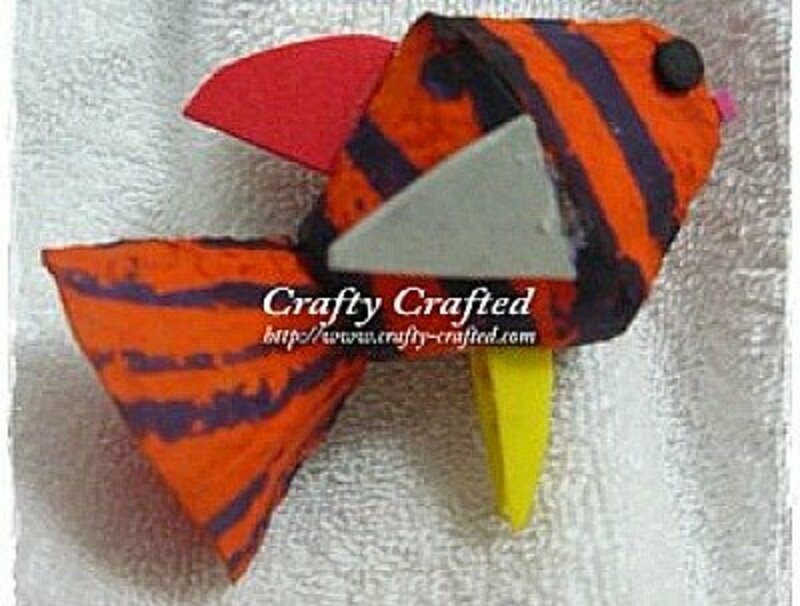 For the directions to make these little fish, go to Crafty-Crafted. 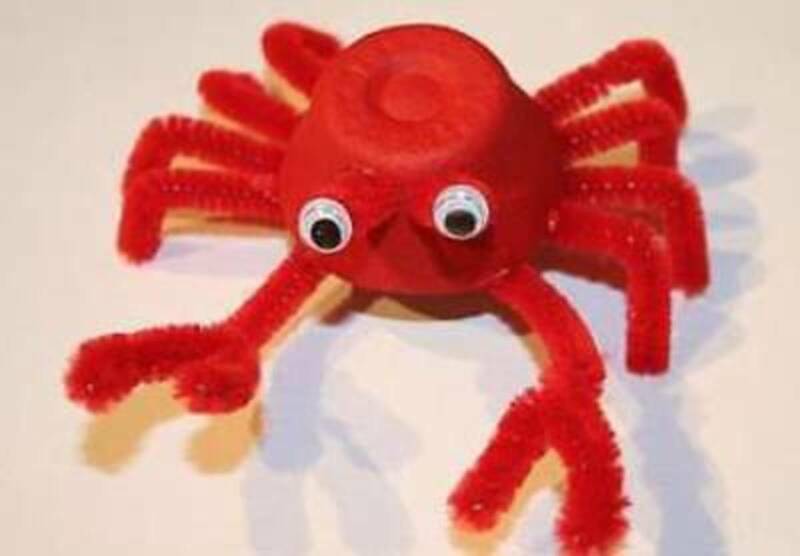 This little creature is so bright and cheery looking that he'd make a great school project with a class full of crafters. 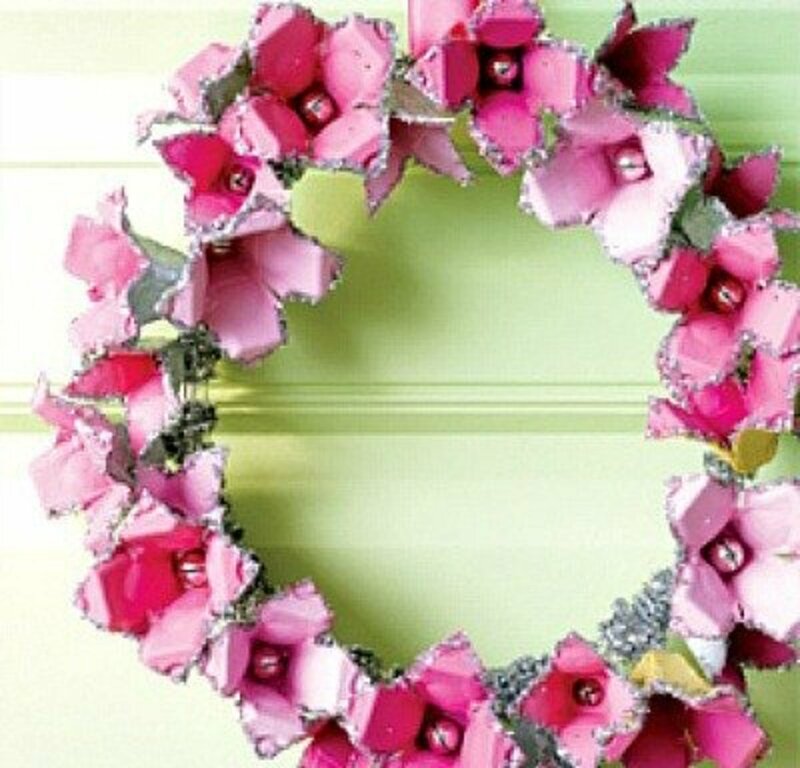 A bright and beautiful egg carton wreath. Go to Pink Stripey Socks for the instructions. You can make a whole flock of chicks at Typically Simple. What farmhouse charm! I'm afraid that I'd want to use this train as a decoration in a baby boy's room instead of leaving a little boy to play with it. 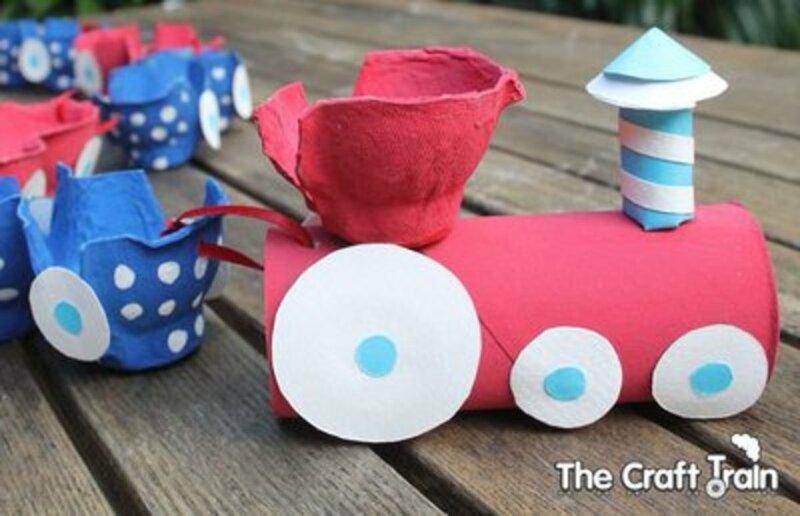 This extra cute train project comes with a tutorial at Bon Bon Break. Outstanding! This egg carton bat would be a nice classroom project. Although the site is in a foreign language, the pictures are easy to follow. 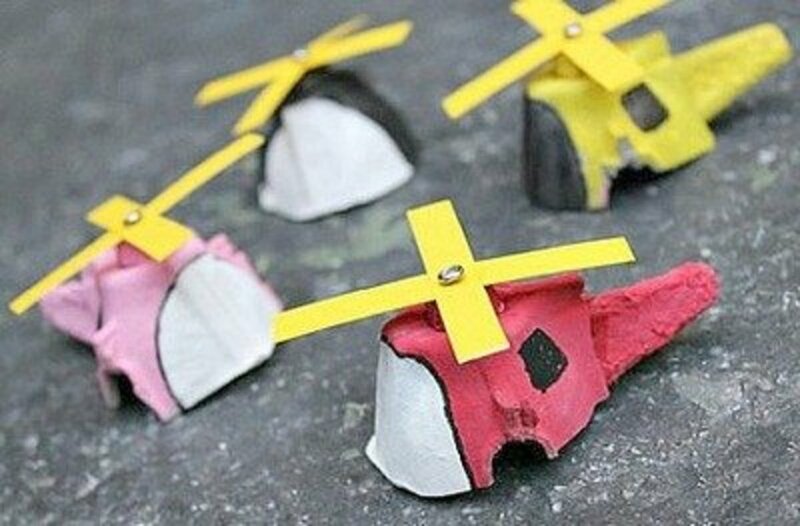 I think these little mini 'copters are so cute and look like they would be just as much fun to make. Find the directions at The Craft Train, and make a fleet of copters for the kids to play with. 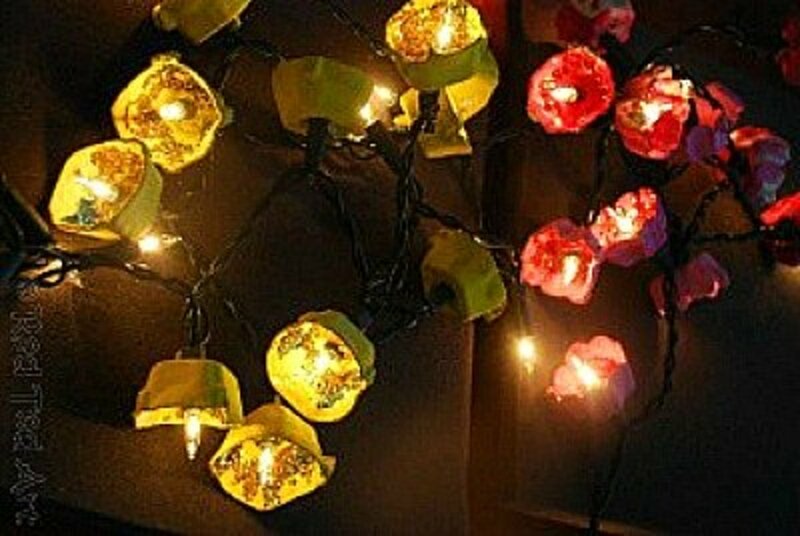 I love these blossom lights. Find the instructions at Red Ted Art’s Blog. 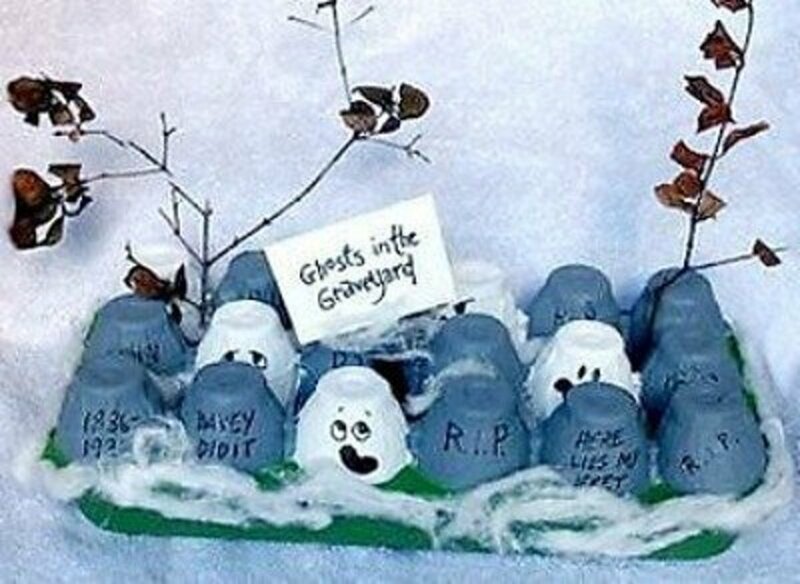 Every child could make this and have their own Nativity scene. 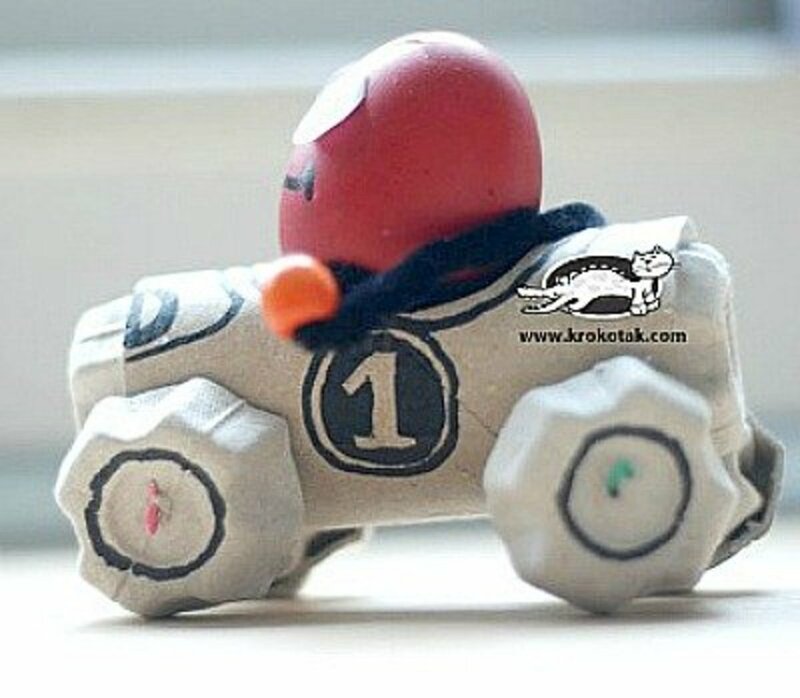 This simple race car is made using a toilet paper roll and an egg carton. How excited your little one will be to see you make a race car for them! 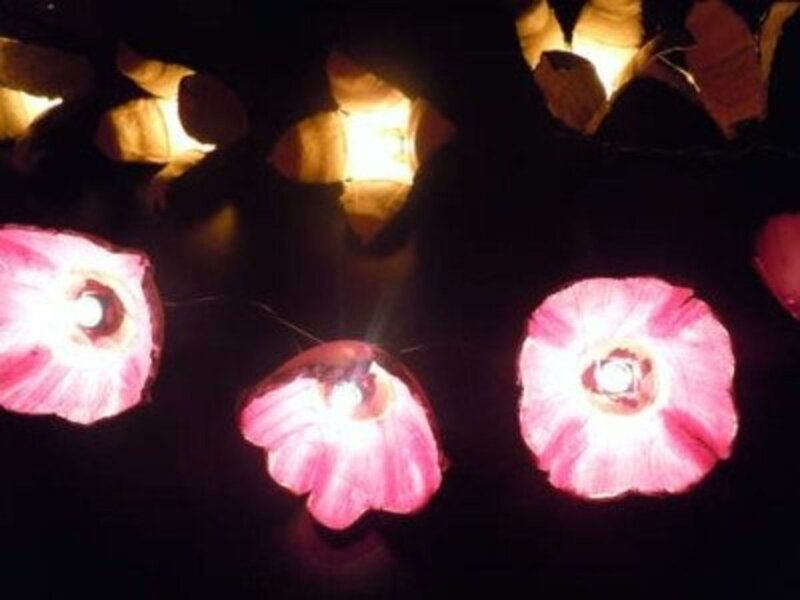 There are so many ways these lights could be used to decorate any room that you wanted. Go to Instructables for the directions. This will be fun to make and also fun to play. The instructions can be found at Tanya Staab. 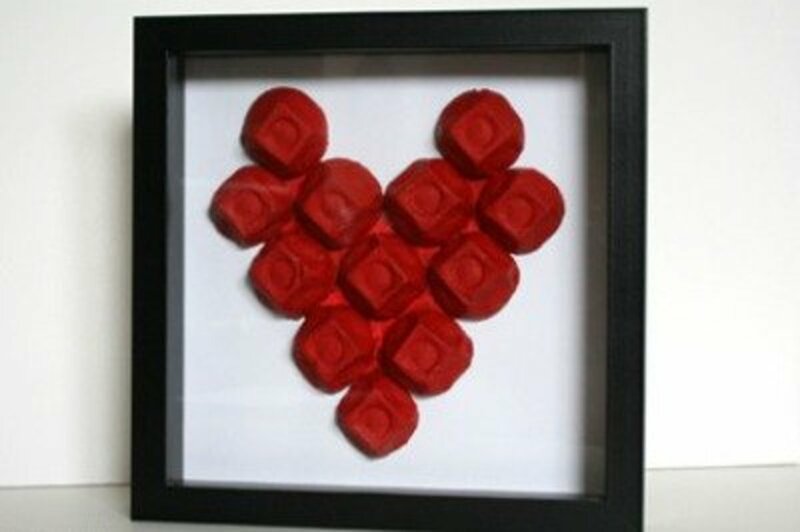 Your loved one will never guess that you made this framed heart gift from an egg carton—unless, of course, you tell them! 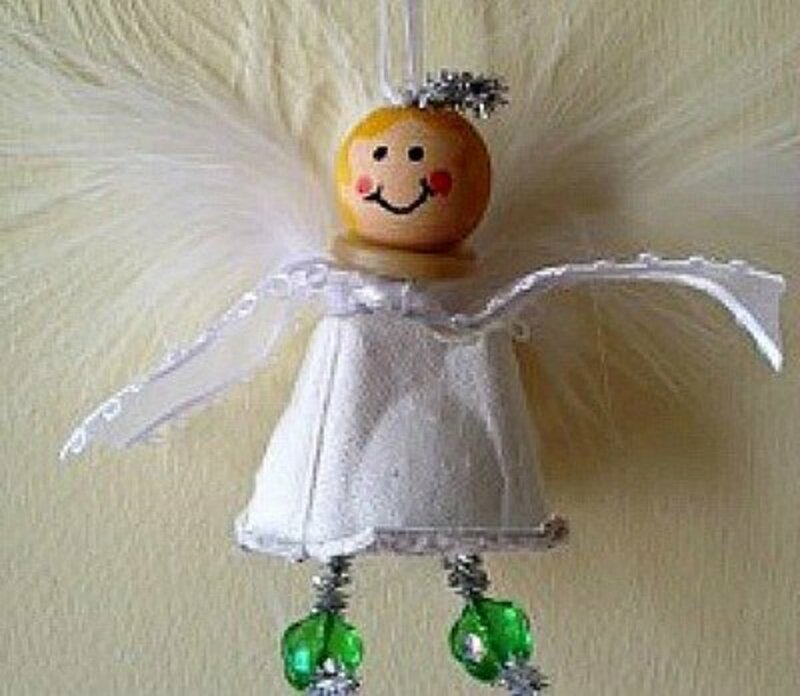 Make many of these ornaments for your tree. The directions can be found at Meaningful Mama. Find the directions and the downloadable images for this project on the Catholic Icing site. 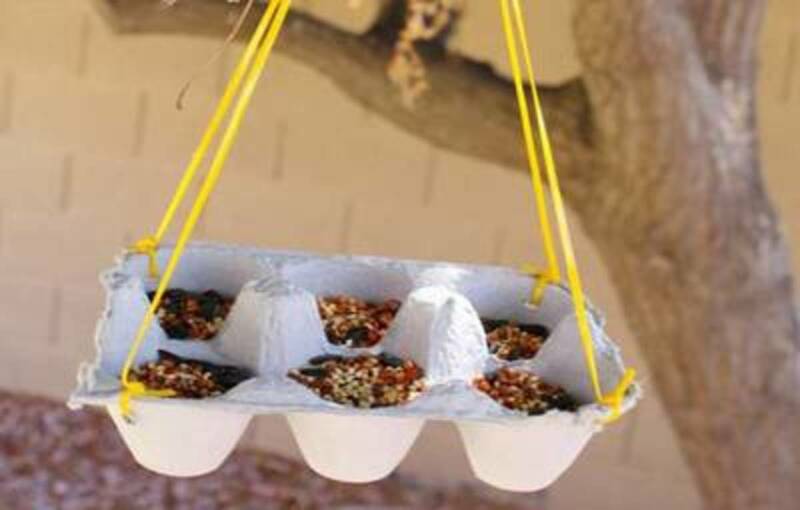 This project is a great use for the half dozen size egg carton because it's just the right size. 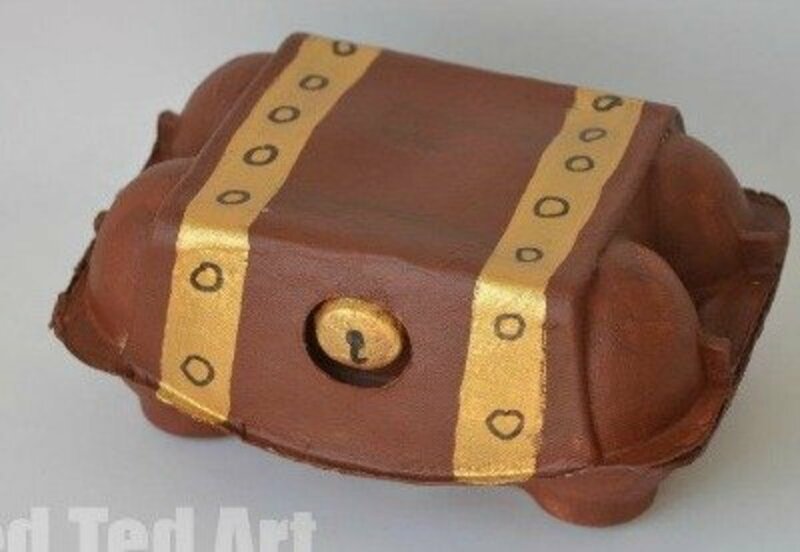 Red Ted Art shares the instructions for making a treasure box that holds all your important items. 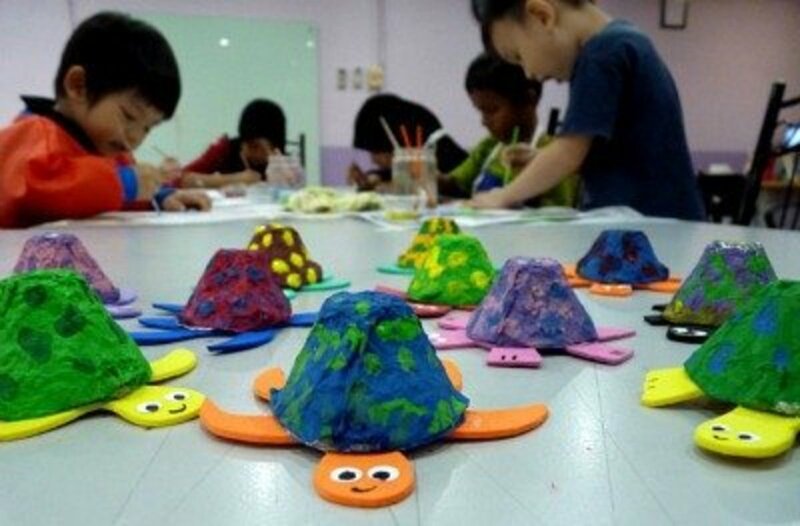 A project like this egg carton turtle helps kids learn how to use brushes and to paint. Be sure to put newspaper over your work area to help with the clean-up process. 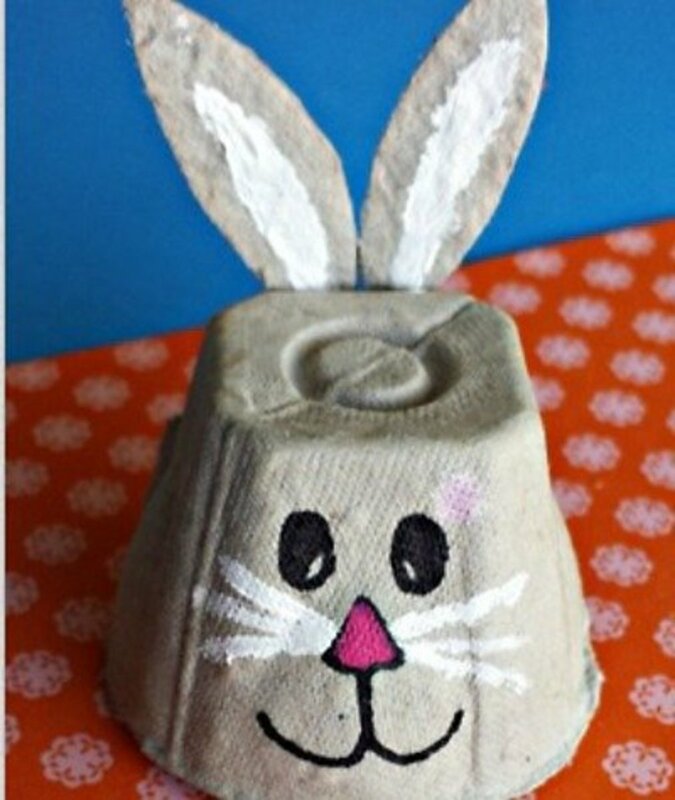 Look at these little treat boxes made using egg cartons. Don't they look sweet? 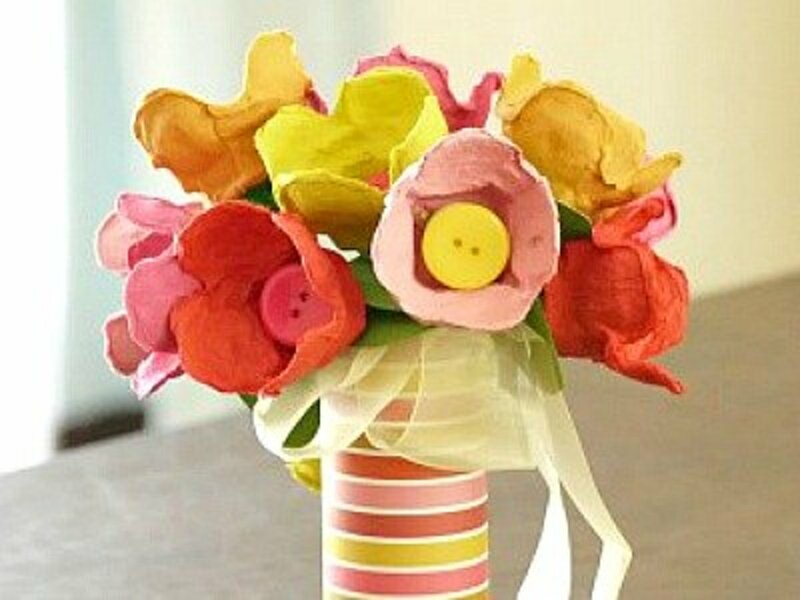 Make a bouquet of lollipop flowers to give as a gift. 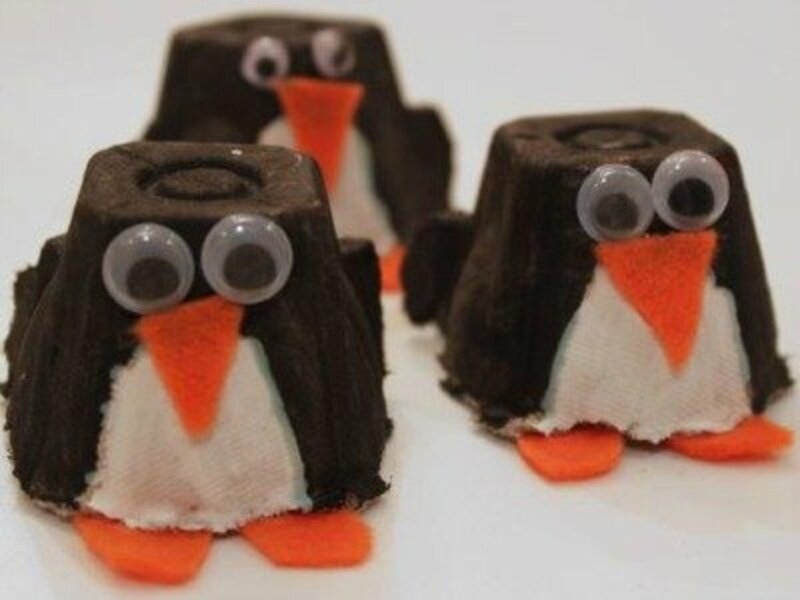 Find the instructions for making this project at Crafts By Amanda. If you make a rooster like the one shown above, you will definitely have something to crow about. 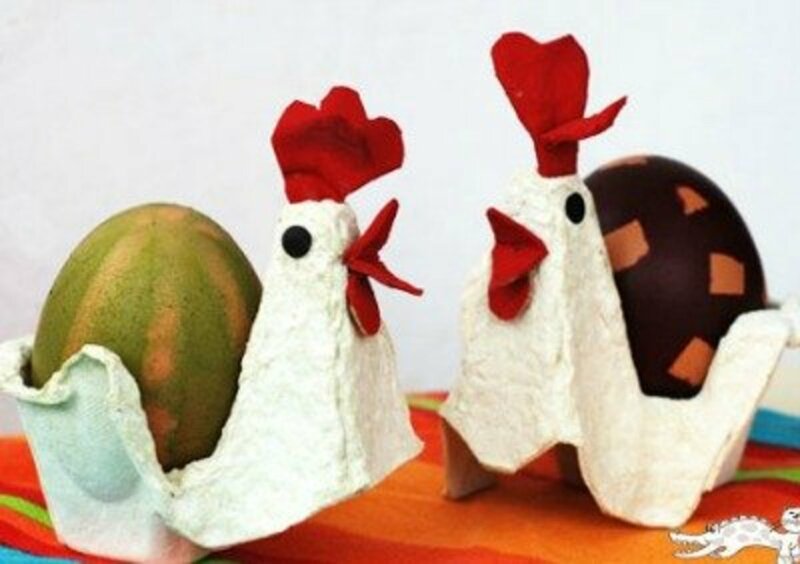 Although the tutorial for this egg carton rooster is written in a foreign language, the photos are self-explanatory. It's always fun to make new decorations for Halloween, so this graveyard and ghost project will be a fun centerpiece to make. 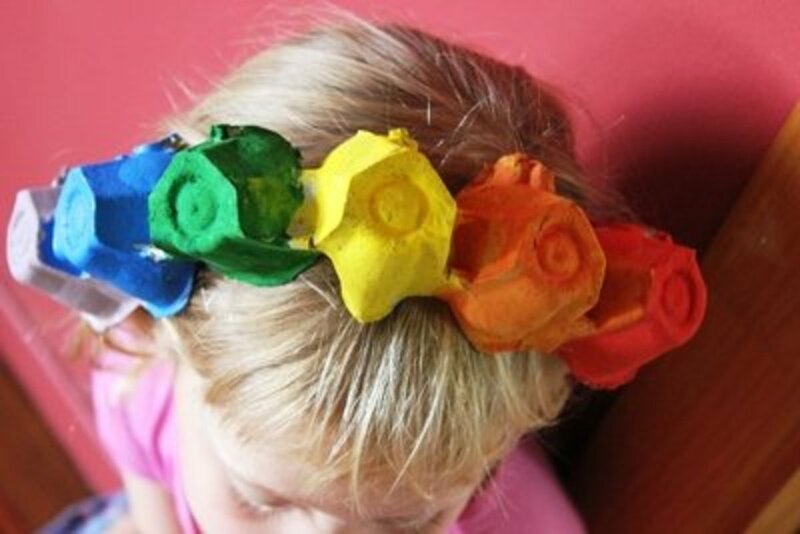 You'll find the instructions for making this inexpensive fairy crown using an egg carton. What little girl wouldn't love to make and wear a fairy crown that she made herself? Cute, cute, cute! I love these little hens. 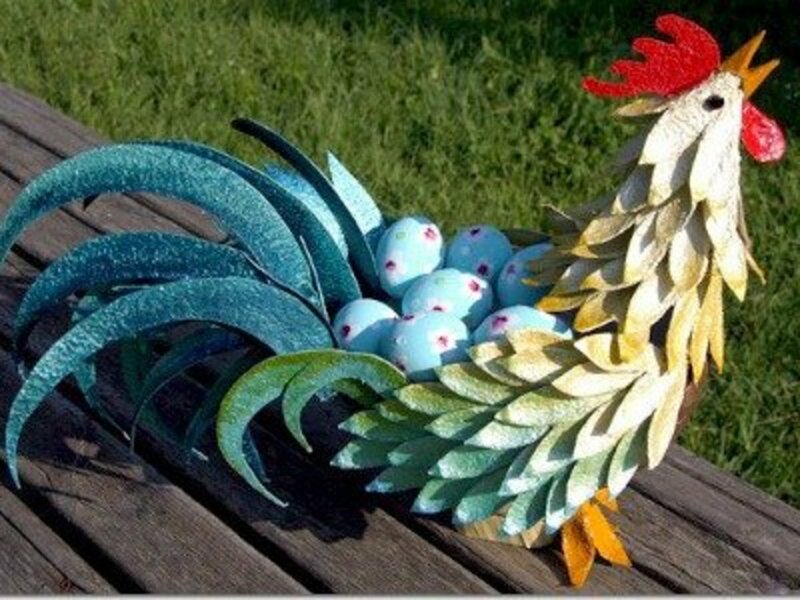 Imagine painting or covering plastic eggs and filling them with candy or a small toy. 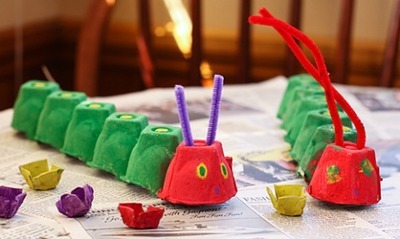 This is a super cute little caterpillar that the kids will love to make. 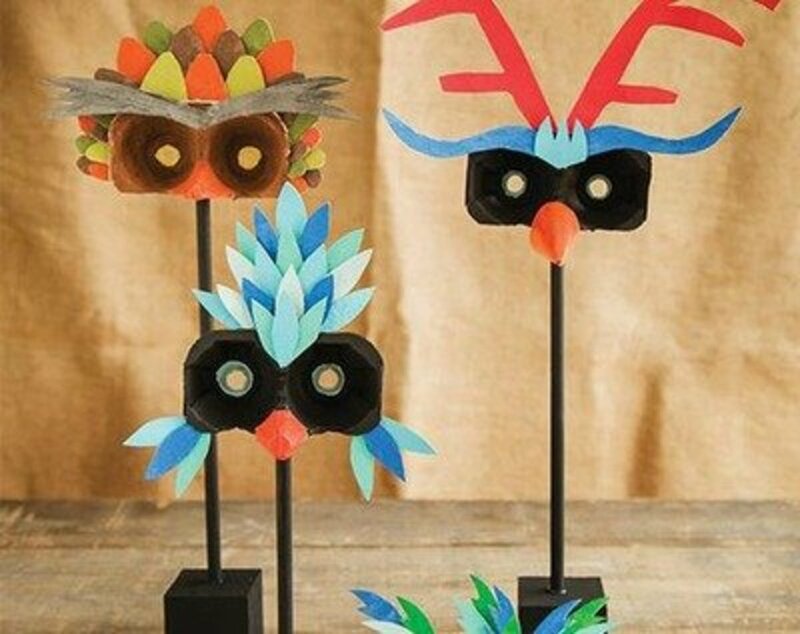 Check out the tutorial at Sweet Paul to make these outstanding bird masks. What fun!! 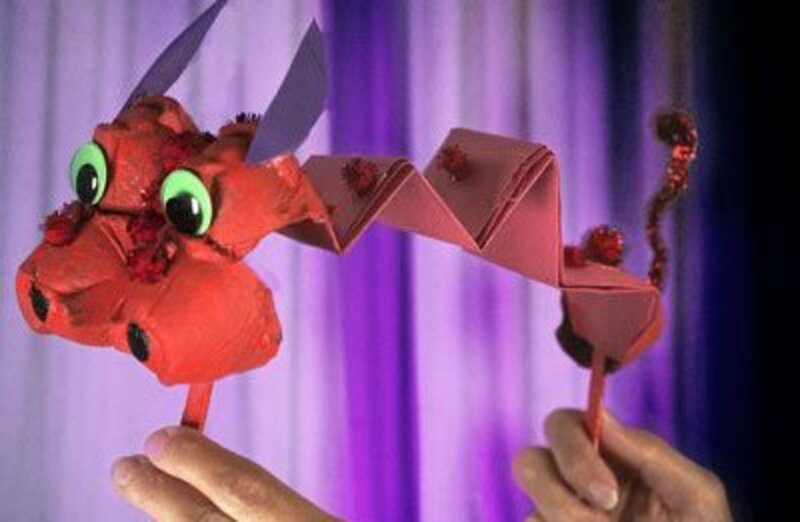 Make a brightly painted dragon puppet. It will be a favorite project for many kids. 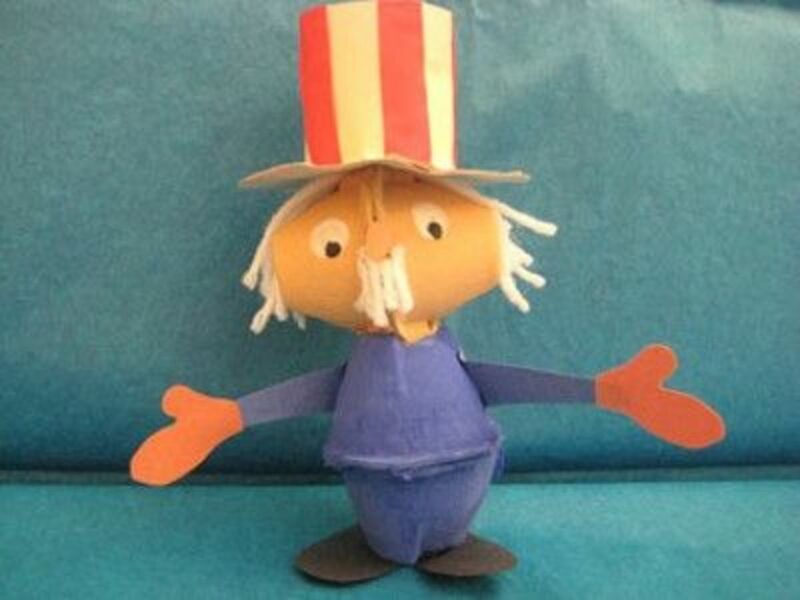 To get the directions for this cute little Uncle Sam, go to Family Education. 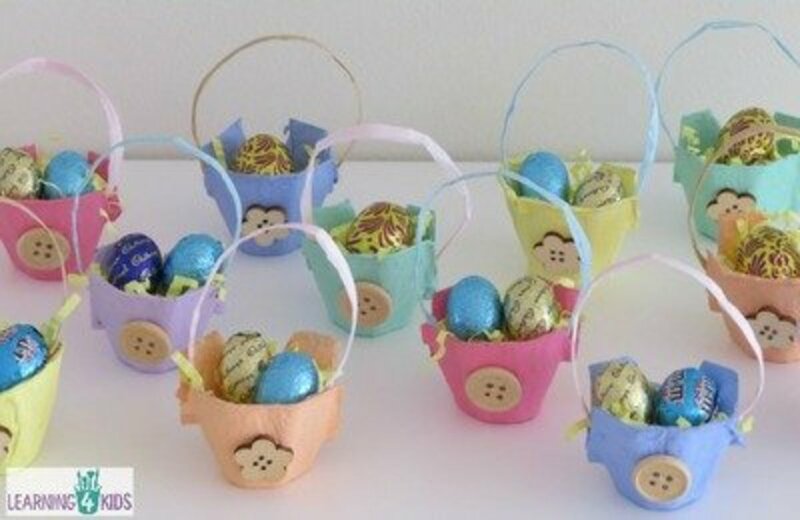 Make little baskets like these to hold treats for any holiday or celebration. Go to Learning4Kids for the instructions. 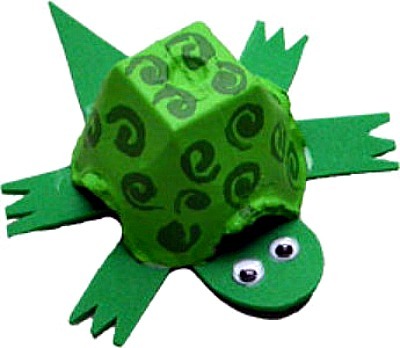 This is another egg carton turtle project that I think is different enough from the first one in this article, so I included it. 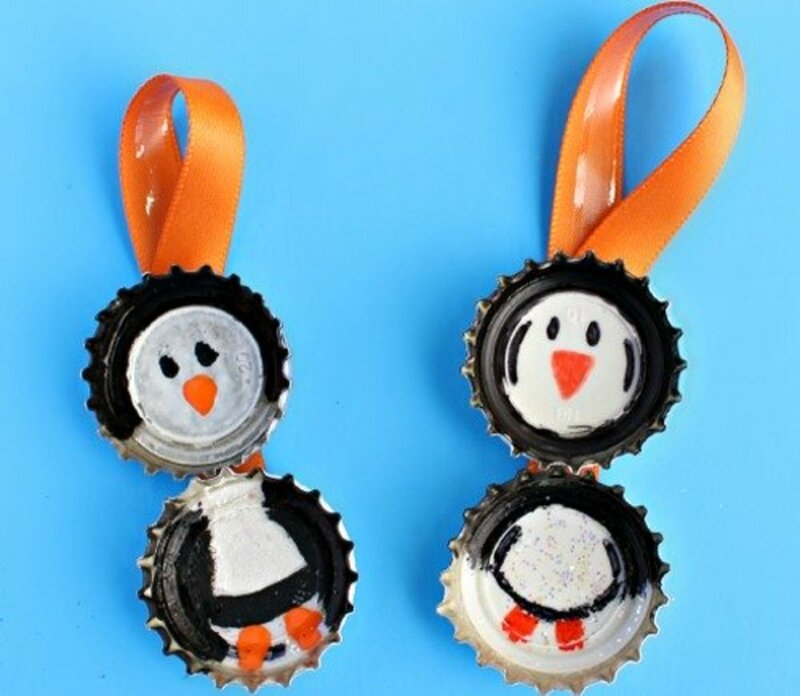 I realize that there is one penguin project on this page already, but this craft is different enough to add here. 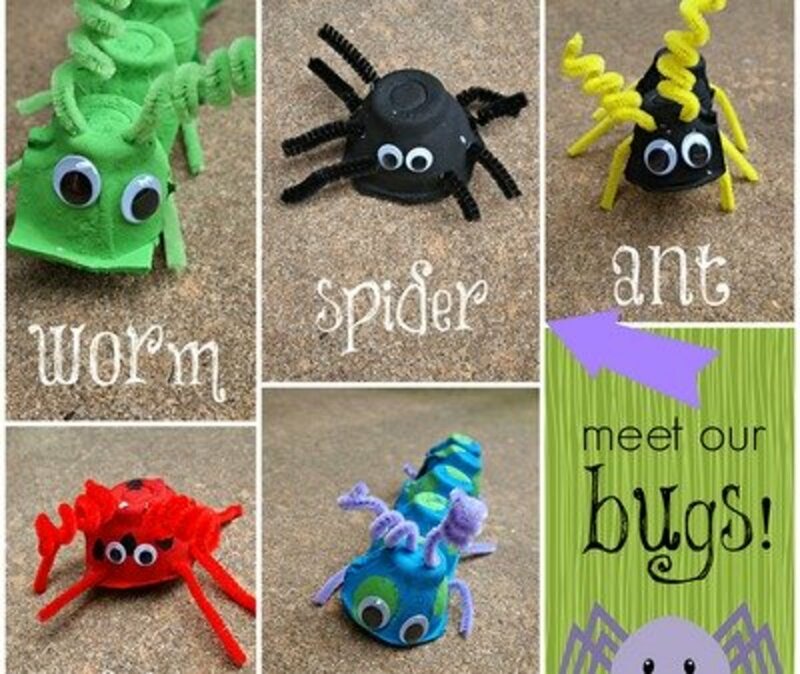 You'll find all sorts of cute bugs to make when you visit Design Dazzle. Easy, but oh so cute! 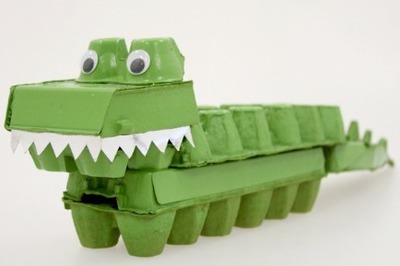 It's hard to believe that this outstanding crocodile is made using the simple egg carton. 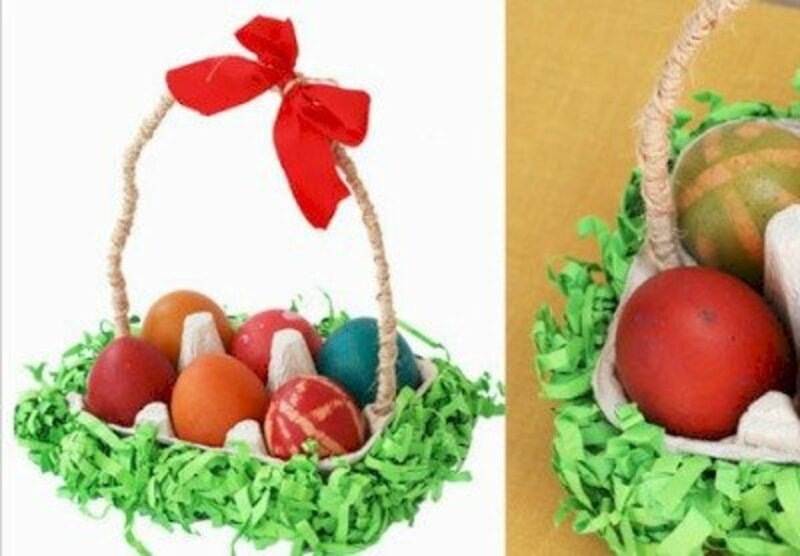 I think I would use purchased green Easter straw to make this cute little basket. Or you can follow the directions at Krokotak and make your own straw with green paper. 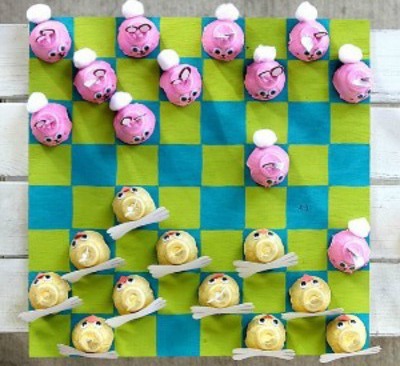 This project is so easy and so cute! 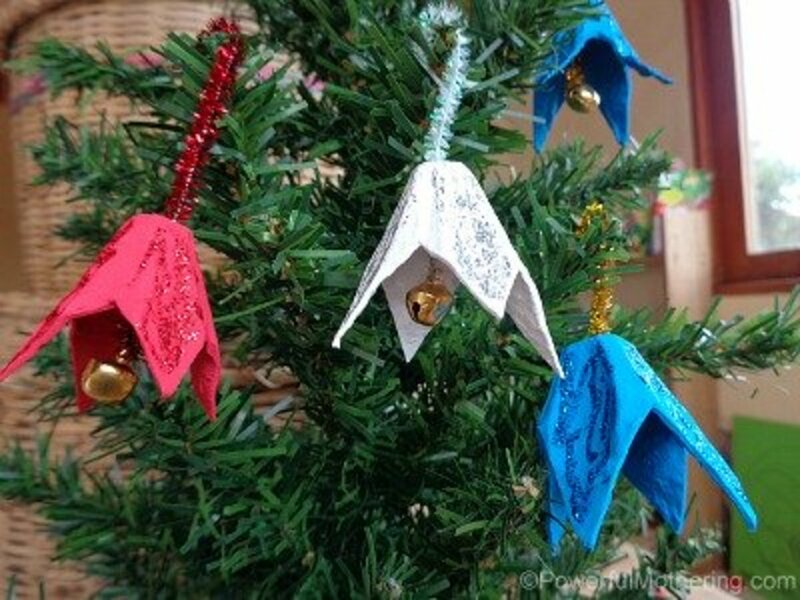 The kids will so enjoy painting, assembling and glittering these jingle bell ornaments. Follow the instructions at The Creative Cubby to make your own bird feeder. You'll have many bird friends in short order. 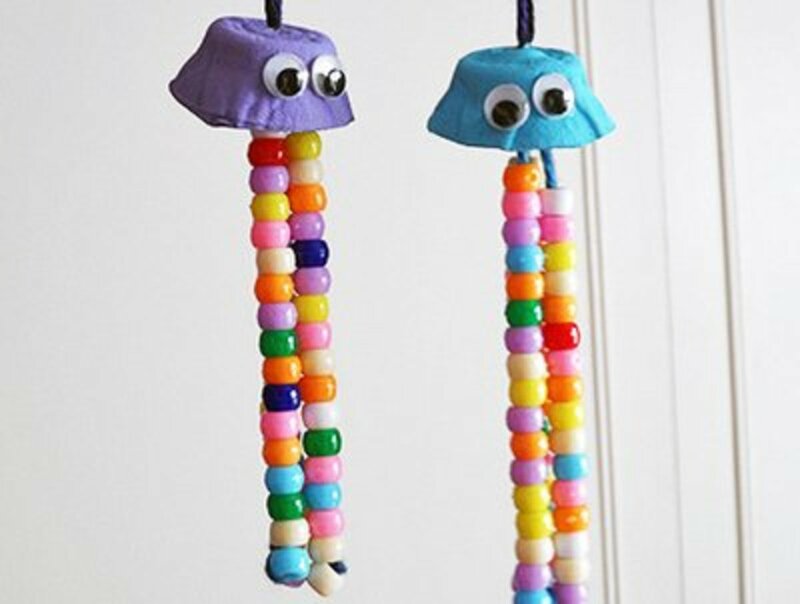 To make these cute and easy jellyfish, go to Fun Family Crafts for the directions. I didn't realise you could do so much with egg boxes! I go to a craft group on Thursday mornings, and I have some ideas for the group now! Thankyou. Thanks for the nice comment, TarekMamdouh. The video you suggested does have a lot of great ways to use egg cartons. People are so creative. What fun ideas to use in the classroom and at home. I like how you can use them for seedlings too. What a lot of fun ideas. I've only ever really used them for seedlings. So many clever ideas filled with whimsy. Love the bunnies, bats and turtle.